In what was already a special night for the Williston boys hockey team who donned special military-inspired jerseys emblazoned with the crests of each of the armed services in honor of military appreciation night, the Wildcats took it a step further by defeating their green and white rival, #11-ranked Deerfield, in a Lossone Arena that was packed to the hilt with spectators and fans of both clubs. The energy was palpable from the get-go, the music was bumping, and the action was intense. In the end, Williston was able to garner three goals to Deerfield’s two, taking their first game off the Green Doors in the last six years. Williston got on the board just :46 seconds into the tilt when, toward the end of their shift, Hunter Sarro worked a puck in the neutral zone to James Belleavoine who broke down the left side of the ice into the Deerfield zone and made a pass across the top of the crease to a streaking Cam Mariani who deflected the puck past Dartmouth-bound goalie, Thomas Gale. The rest of the period was a battle with gritty plays and explosive body-checks echoing around the Quonset hut of Lossone. Williston entered the first intermission up, 1-0. In the second, Williston added to the lead at the 5:14 mark when, the Belleavoine-Mariani-Sarro line struck again. First, Sarro worked hard along the left offensive wall to keep up a puck in the zone, getting it down to the corner. Mariani raced to it, beat his man and with his back almost flush against the wall, made a tape-to-tape pass to a wide open Belleavoine, ten feet from the crease near the left-circle hashmarks. Belleavoine knew what to do and put a neat shot just past Gale’s glove. Big Red doesn’t fly off the handle often, but his celebration rivaled that of famed 1980s Rochester American blueliner Jim Hofford. Deerfield would claw back three minutes later but Jake Sacratini got the eventual game winner when Matt Pimental worked a puck to Brendan Nehmer who broke in the Deerfield offensive zone, took a shot that was blocked but was quickly gathered by Sacratini in the mid-slot who took all that Vezio ever taught him and beat Gale glove-side. Sacratini said hello to the ice with his glove and then jumped high into the glass in celebration. The rest of the period continued to be a battle as both teams pounded one another trying to gain any advantage they could. As the horn sounded for the end of the period, Williston led, 3-1. In the third, Williston fell back into a more defensive shell at times but one that kept Deerfield at bay allowing Wildcat goalie Kyler Breland to see and gather all incoming shots. Always a club with a flare for the dramatic, Williston gave up a late goal on a 6-5 after a Wildcat defender’s stick was slashed out of his hand, but the whistles were put away early in this contest, so no foul was called. After the goal, Williston coach Derek Cunha respectively disagreed with the no-call but to no avail. While the game still had two minutes left, Williston buckled down, sacrificed their bodies, and as the final horn blew, I swear some of the solar panels atop the arena were jostled free from the eruption of cheers and huzzahs emitted from the Williston faithful. Deerfield outshot Williston, 36-22. The game puck was earned by Jake Sacratini whose strong play in Wednesday’s Canterbury game carried over to this one. With the win, Williston inched one game closer to .500 and even closer to an elusive playoff birth, though the fates still hold the cards for the latter. With just three remaining games left, Williston welcomes Albany on Wednesday afternoon. Fans will remember that Williston took one on the chin at the hands of the Cadets back in December when they lost in the first game of the St. Sebastian’s Holiday Tournament, 3-0. Williston, though, is a different team than two months ago, so look for an exciting rematch. Puck drops at 4pm on Wednesday at Williston. We look forward to seeing you there. The Williston boys hockey team boarded the mini busses on Wednesday and headed down to New Milford, CT to take on the Canterbury Saints in a rematch of their December 12th game. In this go-round, Williston got the better of the Saints, winning 6-4. Williston got on the board early in the first period when Brendan Nehmer worked hard in the corner to work a puck to the right point to Alex Berg who played a little pinball with a shot that hit a number of Canterbury sticks and deflected past goalie, Cal Skwara. The goal was the Floridian’s first of the year. Williston got their second goal of the game when Brendan Nehmer poke checked a Canterbury forward trying to skate the puck out of the zone. As Nehmer grabbed the puck, he drove to inside the right circle and let a pass go cross-crease that was tipped in neatly by Jake Sacratini giving the ‘Cats a 2-0 lead after the first. In the second, Canterbury found their way coming out strong and scoring a goal three minutes into the frame. Williston scored the next two goals; the first coming off a Shaul Mitton faceoff win in the Canterbury zone that went back to Jack Purcell who let a Chicago-clapper go from the top of the left circle. Fans who were there said that the shot reminded them of the butterflies known to frequent Rochester, New York’s Lilac Festival in early May. Jake Sacratini got his second goal of the game when some crafty maneuvering below the circle tops saw Tommy Harty work a puck to Brendan Nehmer who made a pass on the Canterbury crease where Sacratini took a swipe at the puck only to have it kicked in by an opposing defenseman. Then, with under a minute-and-a-half remaining, Canterbury cut the lead to two. In the third, Canterbury scored two goals, tying the game at the 7:04 mark. However, Williston put the screws to the Saints when Tommy Harty and David Novotny worked hard in the deep left corner of the Canterbury zone working a puck to a streaking Tim Rego who buried the puck just five feet from the goal past Skwara replacement, Connor Cherry. Brandon Barrett sealed the deal when Shaul Mitton put on a hard forecheck forcing a turnover that Brandon Barrett was able to collect behind the Canterbury net. With the patience of a monk, Barrett crept from behind the goal line and found daylight through a minute hole that beat Cherry. Chippy play at the end of the game was no match for Williston as they sealed the win. Williston outshot Canterbury, 31-30. Barrett earned the game puck for his diligent efforts all game and his more than timely goal. This Friday, Deerfield (our neighbors to the north) come to visit the Lossone Ice Palace. Williston will be honoring those in our armed services in military appreciation night. The Williston team will be wearing military inspired jerseys and socks in honor of those men and women who serve and who have served. There will be raffles and other fun activities throughout the game. Please come on down and support the Wildcats and the United States Military. Williston entered last Wednesday’s game against the #8-ranked Northfield Mount Herman Hoggers looking to find their way back in the playoff hunt after losing to Loomis before Long Weekend. However, the Wildcats took another step away from their final goal of playing in the post-season losing, 3-2. NMH got on the board in the second period when a Williston turnover inside their own blueline resulted in a goal from a shot at the circle tops that beat Kyler Breland between the legs. Williston responded four minutes later at the 15:08 mark when James Belleavoine skated the puck out of the Williston zone, into the Hoggers end and drove to the left corner. Number fourteen then evaded a defenseman and slipped a pass through the crease to a patient Tim Rego at the right point. Rego’s hands were as smooth as Abbotts Custard as he cruised to the top of the left circle, careened to the side of the net and brought the puck from his backhand to his forehand tossing a shot into the upper right corner. It was a dandy goal and one that brought the Williston faithful to their feet. In the third, NMH scored a goal on a cross ice feed on the power with 3 minutes remaining in play and then the next shift on an innocent looking shot from the top of the left circle to go up 3-1. Williston scored with one-second remaining, but it was not enough. Williston was outshot 36-22. The ‘Cats played an excellent game but a two-minute lapse toward the end of the third period was the downfall of the boys from Easthampton. The Wildcats stabled the Millbrook Mustangs on Saturday afternoon in Millbrook, NY. Millbrook had all sorts of reasons to come up big—Senior Day, Military Appreciation Day, Alumni Weekend, Winter Weekend, and thoughts of avenging an earlier loss to Williston a month prior. Fortunately for the Wildcats, they had the antidote: J-I-M-M-Y. James Belleavoine notched a hat-trick, including the game winner in overtime to win the game, 4-3. Belleavoine got things going at the 5:32 mark of the first period when Cam Mariani cleared the puck up the left-wing boards. Belleavoine came screaming up the wall and was able to beat the pinching defenseman to it and head up on a 2-1. Looking off his roommate Hunter Sarro, Belleavoine shot from the hash marks that was saved by Millbrook goalie Cam Fernandez but following up the shot, he buried the rebound. Millbrook evened up the game five minutes later. Then, with :47 seconds remaining in the period, Belleavoine struck again when Cam Mariani knocked a puck to the left boards that was picked up by Alex Berg who skated up the wall and made a pass to Belleavoine who had a step on two Millbrook defenders; Belly split the d and drove to the net letting a back hander go with pressure from his right. The puck sailed over Fernandez into the top right corner. In the second, good forechecking led to Tim Rego picking up a puck outside the Millbrook blueline creating a three-on-one with Brendan Nehmer on his left. Rego slid a pass to Nehmer who used his fancy mitts to slip the puck between Fernandez’s pads to go up 3-1. Penalties hurt Williston as Millbrook scored with :11 seconds left in the second period to bring the game to within one and then with :42 seconds remaining in the third and on a 6-on-4, Millbrook buried the tying goal. Williston could have packed up their bags and quit after losing a two-goal lead but in overtime, Shaul Mitton got a puck in the offense zone to Tim Rego at the point who, again, slipped from the right point to the slot and let a backhand ride that was blocked; the puck then bounced fortuitously to Belleavoine who drove down from the point after covering for Rego and let a Rhode Island Rocket go from just above the hashmarks. Word from Millbrook has it that they are still looking for the puck. Williston arms went up; Millbrook heads went down; and Manager Oscar Ngyuen was one happy manager. Williston was outshot in the match, 32-24 but no matter. Belleavoine earned the game puck for his timely hat-trick. Williston has two games this week. The first is at in New Milford, CT against the Canterbury Saints on Wednesday afternoon at 4:15. The Wildcats dropped their first game of the two-game series in December and look to split the difference. Then, Friday night, Williston takes on Route 91 foe Deerfield at 6pm at Lossone. Williston will be honoring our armed forces in Military Appreciation night. There will be games and raffles during the game so please make sure you bring a friend and head on down! Williston won their third and fourth games in-a-row on Saturday and Monday defeating the Brunswick Bruins 6-2 and the Westminster Martlets 3-1. The wins improved Williston’s record to 8-10-1 and moved them closer to the playoff conversation, though there is much more hockey left to play in the season. With the Bruins visiting Lossone on Saturday, Williston looked to add to their two-game winning streak with number three. Two hours after the start time, it happened. Williston got the ball rolling at 2:25 of the first period when Jake Sacratini bumped a pass from the top of the right circle to Tim Rego at the point; the captain let a shot go as he was drifting backwards that beat Brunswick goalie Dan Dachille over his shoulder. A well-timed screen by Tommy Harty allowed the floater to hit the back of the net undetected. Five minutes later, Sacratini found his name on the goal side of the score sheet when he chased a Brunswick defender into the offensive zone, applied great pressure that worked a puck to the front of the net. Linemate Brendan Nehmer got a stick on the puck that ping-ponged around until center Matt Pimental chopped a backhand on Dachille that was saved; eventually, it squeaked out to Sacratini on his forehand who drove the puck into an open net. Cam Mariani made it a 3-0 game with just under three minutes left in the period when he picked off a pass with his glove at the Williston blue line and sped in on a breakaway. His initial shot was saved by Dachille but he could not control the rebound. The puck sailed three feet straight up and rolled in off his back. The ‘Cats went into the dressing room with the lead. In the second, Brunswick finally got on the board early in the period when they went guns blazing on Williston. The period ended, 3-1. In the third, Williston began to run away with it. Matt Pimental got the puck deep on the left side of the ice and forechecked like the mighty winds off of Lake Ontario during a polar vortex. Coupled with his aggressiveness was the other guy who knows bone-chilling gales, Jack Purcell, who also pursued the puck behind the net. Pimental created space for himself in front and received a Purcell-pass on the doorstep; he shifted left, drove right and slipped a pretty backhander past Dachille. Williston got their fifth goal of the game when Shaul Mitton skated hard into the offensive zone, forced a turnover at the half-wall that was picked up by Harty who drove hard to the goal line from just above the bottom of the circle. A Bruin defenseman stepped up to him but winger David Novotny drove from the corner next to Harty who shoveled him a pass. Novotny took no time and buried the puck under the crossbar. Brunswick would get a second goal on the power play, but Hunter Sarro put the knife in the heart of the Bruins when he received a pass from roommate James Belleavoine on the most selfless play of the season. Belleavoine drove into the zone on a three-on-one, passed up a sure goal on the empty net, and slid the puck to his Sarro. The play epitomized the selfless play of the Wildcats on this day and earned him the game puck. Williston outshot the Bruins, 29-24. In addition, Williston blocked twenty Bruin shots. Williston journeyed down to Connecticut on Monday to take on the Westminster Martlets in what has become an epic battle of Route 10. The Martlets were riding a five-game win streak into the game, were 8-1-1 in their last ten games, and had just been ranked #6 in New England that day. This did not deter the Wildcats, and especially two seniors born and raised in the Pioneer Valley. Brendan Nehmer got Williston on the board first when he blocked a shot, used his speed to out-race a Westy defender to spring himself on a breakaway, and beat Westminster’s Ian Shane on the right side. In the 2nd period Nehmer got his second of the game when he drove up the right side of the ice, cut to the middle of the Westminster zone and let a wrist shot go from just inside the blue, beating Shane glove-side. Alex Berg and Tommy Harty were awarded the assists. Then, just a few minutes later, James Belleavoine got a puck to Cam Mariani on the left side of the neutral zone who drove on a semi-breakaway and beat Shane on the short side. Shane was pulled for Bennett Ostern. In the third, Williston weathered a Martlet onslaught, being outshot 18-1. Kyler Breland stood up to the task letting only one goal by. It should be noted that while the Wildcats did not mount much offense in the period, their defensive zone coverage allowed Breland to see most of the Westy shots, and any rebounds given up were quickly swept away by the Williston boys. Westminster took it to Williston for much of the game, outshooting them 42-11. However, Williston’s defensive play including that of Breland and the ability to bury their few chances were the game-changers. Breland was awarded the game puck. Williston blocked sixteen Westminster shots. Williston takes on its third Nutmeg-state opponent in three games, Loomis Chaffee, today at 4:30 in Easthampton. This is the final game before a well-deserved Winter Long Weekend so please come support your ‘Cats! On the Wednesday before Long Weekend, the Loomis Chaffee Pelicans came to Lossone for a late-afternoon tilt with the Wildcats. Williston was looking to extend its win streak to five games but a feisty and talented Loomis team put an end to that bid. Despite a closely contested game for 51 minutes, Williston eventually dropped the matchup, 5-1. Williston got on the board at the 16:37 mark of the first period on the power play when Tim Rego made a pass on the top of the power play to his left side to Cam Mariani; Mariani let a low shot go that was blocked by Loomis goalie Kyle Chauvette. The pass deflected to the right faceoff dot where Hunter Sarro collected the puck and buried the rebound putting the Wildcats up 1-0. Unfortunately, that would be all the offense they would get as Chauvette shut the door on any other opportunities. Loomis scored five straight goals including two in the second and three in the third. Down 2-1 with about 3 minutes to go in the game, Williston’s attention drifted towards soon pulling the goalie to tie it up with the extra skater. That plan was foiled when Loomis created a low turnover and capitalized making it 3-1. An empty-net goal followed by a last minute tally quickly turned a 2-1 game into a 5-1 defeat. Shots were 30-28 in favor of the Wildcats. Hermon at 3pm. We are experiencing a bit of a heat wave in these parts so a full snow suit will not be necessary at NMH’s partially enclosed outdoor complex. Hope to see you there! After a week-long hiatus due to a hellacious storm on Saturday that cancelled Williston’s game against Gunnery, the Wildcats took to the ice against a talented Millbrook Mustang team who won the Pingree Christmas Tournament and had taken down top-ranked Salisbury and Gunnery this season. Williston played hard-nosed hockey today and took the first of two games this season, 4-2. Williston came out fast in the opening period putting pucks on net and driving for rebounds. Williston struck first at the 1:55 mark when Matt Pimental got the puck to defenseman Mitchell Hansen who let a wrist shot fly from the point. The puck took off like a Jeff Sluman drive on the first tee at Oak Hill rising slowly and beating a screened Cam Fernandez over the glove. The goal was Hansen’s first of his Williston career. In the second after close chances by both teams, Brendan Nehmer got sprung for a breakaway by Jake Sacratini and beat Fernandez on a low shot in the lower right corner with seven minutes left in the period. Pimental picked up his second assist. The Wildcats went into the break, up 2-0. In the third, Tim Rego took a pass from Jack Purcell and flew up the left boards into the zone, fired a slick pass to Tommy Harty who drove down to the dot, cut to the net, caught the pass, and let a low blast go that found the back of the net. Millbrook would pull within a goal on two power play goals—one with the goalie pulled—only to have Rego seal the deal with his ninth goal of the season when, with the Millbrook goalie pulled, he corralled a puck to the side of his net and, from a knee, shot the puck into the open net. Williston arms went up and Millbrook spirits went down. Kyler Breland got the win for the Wildcats. The game puck went to Mitchell Hansen. Williston plays the Brunswick Bruins on Saturday at 1:30pm. Last year, Brunswick knocked the Wildcats out of the first round of the playoffs, 2-0. This year the clubs met at the St. Sebastian’s Holiday Tournament and tied 4-4. This promises to be an excellent matchup. Also on Saturday, the Williston girls’ team plays Hotchkiss in their annual “Pink the Rink” game after the boys’ game. There will be snacks and raffles for excellent prizes with all proceeds going to support breast cancer research. Bring your moolah! Last Friday, the Winchendon Wapitis came to town and Williston was up to the task for two solid periods playing shut out hockey. However, in the third, Winchendon broke open the scoring on a 5×4 off a faceoff. 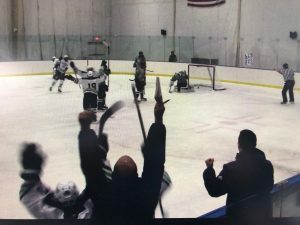 Williston answered the call three minutes later when Jack Purcell let a shot go that beat Max Caouette with assists going to Matt Pimental and Brendan Nehmer. However, with just over two minutes left in the game, Winchendon got a puck in the slot that beat Williston’s Kyler Breland. Williston ended up taking a penalty with 1:40 remaining, and, interestingly, had some of their best opportunities of the game getting robbed twice by Caouette and hitting the post once. Shots were Williston 42-Winchendon 24. The Wildcats played some of their most determined hockey of the year but just came up short. On Wednesday, Williston traveled to the Green Mountain State to take on the Vermont Academy Wildcats looking to get back into the win column. While Williston struggled to pull away in the first two periods, in the third they did just that, winning 6-3. Vermont got on the board early in the game on a defensive breakdown leaving a Vermont player all alone in the front of the net. He beat Kyler Breland cleanly. However, with just under a minute remaining in the period, James Belleavoine came streaking down the right wall in the zone, put a shot on net that was saved but then buried home by a fortuitous Hunter Sarro who charged the net like former Rochester Red Wing Cal Ripkin stealing home plate at the old Silver Stadium on Norton Street. Williston was happy to go into the break tied. In the second, Jack Purcell got a goal when Brendan Barrett cruised down the left wing and let a shot ride from the dot. The VA goalie made the save but Jack Purcell skated like the Chicago wind and buried a rebound to go up, 2-1. Vermont scored again to tie it up, but just minutes later, Tim Rego headed into the Vermont zone on a 2-1. He made a sweet pass to Brendan Nehmer who missed the net but Rego drove behind, corralled the puck and tucked it past the goaltender. Sloppy play led to Vermont tying the game, 3-3 heading into the dressing room. In the third, Williston started to put things together, first when Tommy Harty won the faceoff to Mitchell Hansen who quickly moved the puck to Rego. The senior defensemen cranked down the left side of the ice and ripped a shot top-cheddar to go up, 4-3 just :13 seconds into the frame and on the power play. Then, Matt Pimental took a puck from the left corner, drove the net and let a backhand rip that looked like it was shot from a sand wedge going top corner. Brandon Barrett got his second helper of the day. Finally, Cam Mariani scored an empty net goal from Alex Berg to seal the deal, 6-3. Williston outshot Vermont 40-15 as Kyler Breland got the win. Yesterday, the Wildcats enjoyed the first pond skate of the year playing shinny hockey with the coaching staff and their kids, Gus, Ryan, and Will. There was something beautiful about making the first tracks of the year on black ice that warmed this writer’s soul. Hopefully it will lead to some magic for the players as we push to make the playoffs. Tomorrow, weather permitting, the ‘Cats head to Gunnery for a 4:30 tilt. Check the twitter for updates. On Saturday, Williston looked to rebound against the Berkshire Bears after a two-game losing streak that ended 2018. With a number of alumni on hand, the Wildcats looked to impress; unfortunately, it was not to be as Williston dropped the contest, 5-3. Twenty minutes in penalties did not help the cause. Williston jumped out on top at the midpoint of the first period. Brendan Nehmer took a pass on the half-wall and sprinted up the ice on the right side with Cam Mariani and James Belleavoine jumping into the rush with the speed and energy of Irondequoit Creek in the April thaws of Upstate New York. As Nehmer crossed into the zone, he dropped the puck to a waiting Belleavoine who let a shot go from the far hash marks. A fortuitous Mariani darted at the net and was able to get a stick on the puck beating Berkshire post-graduate goalie, Kenny Burgess. Williston would hold the lead for the remainder of the period. In the second, Berkshire got two goals, both on the power play to put the Bears up 2-1. The lead would hold for three minutes when, on a power play of their own, Williston tied the game at two. Tommy Harty took a puck in the left corner of the Berkshire zone and passed to David Novotny at the point. David worked the puck back to Harty who curled around the top of the circle and let a shot fly that was deflected onto Jake Sacratini’s stick on the high left post. Seeing an opportunity, Novotny cruised into the slot, took a pass from Sacratini and let a backhander rip from the mid-slot that beat Burgess between the pads. While no panes of glass were trembling at the ferocity of the shot, it was good enough to tie the game. The tie would only last for a little over three minutes when Berkshire scored with just 23 seconds left in the period to go up 3-2. In the third, Cam Mariani tied the game with a blast from just inside the blue line that went in the top right corner (Belleavoine and Novotny with the assists) but Berkshire was too much, scoring two more goals to seal the win. Shots in the game were 27 for Williston, while Tyler Breland faced 30. On Wednesday, the Worcester Hilltoppers came to Lossone. Last year, the Wildcats were losing to Worcester, 1-0 going into the third only to pull out a 4-1 win. This year was a different story as Williston beat Worcester 14-3. Notable efforts for the afternoon were Jake Sacratini (3g, 1a), Hunter Sarro (2g, 2a), David Novotny (2g, 2a), Brendan Nehmer (1g, 2a), and Tommy Harty (3a). Trevor Corsello got the win. Williston outshot Worcester, 42-16. This is a big weekend for the Wildcats. On Friday night, Winchendon comes to town for a 5:30 game. Williston defeated the Wapitis 7-1 at the St. Sebastian’s Tournament in December so look for the Green and Black to come out with vengeance. Then on Saturday, Williston looks to even up the season series with Berkshire in Sheffield, MA at 4:30. We hope to see you tonight! There’s a scene in The Big Lebowski when The Dude sits down next to an old grizzled cowboy at the bowling alley bar. As The Dude laments his misfortunes, the cowboy, played by Sam Elliot, finally remarks: “Well, a wiser fellar than mahself once said “Sometimes you eat the bear and sometimes the bear eats you.”” With his Southwestern drawl, the deity-like cowboy pronounces “bear” as “bar.” Last year, Williston ate the “bar”, coming from three goals behind to win in overtime, 4-3. Today, the Williston Wildcats were unfortunately on the receiving end of the “bar,” going down 6-0 and eventually losing 8-3 to St. Sebastians. While I readily admit the following cliché, the game was not an 8-3 game; fortuitous bounces for St. Sebastians that included a puck ricocheting off a stanchion on a Williston powerplay only to end up on the stick of Sebs penalty killer who took off on a 2-1 and scored; to a shot from the point that was deflected and popped up eight feet in the air and bounced over Kyler Breland’s head and into the net; to a potential 3 on 1 for Williston only to have David Novotny blow a wheel and careen to the ice, losing the possession, the puck-luck needed to beat a very powerful offensive and defensive opponent—that boasts currently seven Division I prospects with more on the way—was not there when the Wildcats needed it. St. Sebastians took a commanding 6-0 lead through the first period and half of the game through the work of savvy offensive skill and a defensive juggernaut that was difficult for Williston to solve. In the second, Williston was able to get on the board when, in the offensive zone, Matt Pimental won the draw cleanly to Jack Purcell who let a quick shot go that was saved off the right pad and bounced onto sophomore Brandon Barrett’s stick; Barrett buried the rebound for the first goal of his Williston career. Then, two minutes later at the 17:19 mark of the period and on the power play, Brendan Nehmer took a puck near the top right point and let a shot go that hit a Sebs player and bounced over the shoulder of a shocked Luke Garrity. Williston looked like they might have some life to them heading into the third period. Unfortunately, any hope was shot down as St. Sebastian’s Tommy Lyons drove to the net with two players draped on him and was still able to get the toe of his stick on the puck and sneak a shot past Breland. Brendan Nehmer got his second goal of the game cutting the lead to 7-3 (Novotny and Sacratini with the assists) but Sebs got its eight goal a little over a minute later. Trevor Costello went in and made some clutch saves down the stretch, but Williston could never get back into it. On Saturday, Williston played Nobles in a rematch of last year where Williston took the game 3-2. This year would be different for the ‘Cats as they would drop the match-up, 5-1. Nobles got on the board early in the game on a powerplay. Williston would answer a few minutes later when Shaul Mitton got a pass from Tommy Harty on the break-out. Mitton cruised down the right boards and beat Nobles goalie Marc Smith to tie the game at one. Nobles would score the next four goals, one more in the first period and three in the second. Williston worked hard in the third to cut the lead but to no avail. Shots in the game were 29-18 in favor of Nobles. Williston returns to school on Wednesday and takes on the Berkshire Bears at home on Saturday at 4.30. The Williston co-ed alumni game takes place at 12.30 that day so let the alumni office know if you will be making the trip in for the game. They say that a tie is like kissing your sister, however, with Williston trailing the Brunswick Bruins with eighteen minutes remaining in the game, it was more like kissin’ the gal next door. Williston was down 4-2 with a period remaining when clutch play by the Wildcats tied the game with eleven minutes remaining. Five minutes of overtime could not solve the tie and Williston would head into the Christmas Holiday, 3-5-1. Williston got on the board early in the first half when, off a faceoff on the left side in the offensive zone, Brendan Nehmer won a draw back to the pride of Pittsford, NY, Zac Gmerek, who put the puck deep into the corner. Winger David Novotny retreated from the front of the net, picked up the puck and shoveled a quick pass to a waiting Jake Sacratini who was three feet off the left post and snuck a quick redirect that found a hole through the Brunswick goalie, Dan Dachille. Brunswick would answer on the power play nine minutes later. Shaul Mitton made it a 2-1 game when he busted down the right side of the ice, crossed over the Bruin blueline and let a wrist shot fly from the tops of the circle beating Dachille on the far post. It was Shaul’s fourth goal of the season at the 13:02 mark of the game. But alas, Brunswick again would respond on the power play three minutes later. The teams would head in to the dressing room knotted at twos. Brunswick came out smoking in the second half and went up 4-2. Williston called a time out with eighteen minutes remaining in the half. In the short respite, Coach Derek Cunha spoke confidently reminding the team that they still had a period left to score two goals. If they could get the two, they could win it in overtime. Rejuvenated, Williston started to claw back when Brunswick chipped a puck to the Williston blueline and changed. Immediately, Alex Berg retrieved the puck and sent a quick pass to Novotny who was cutting into the Brunswick zone. Number 10 looked up and let a laser go that beat Dachille over the glove and into the top right corner cutting the lead to one at the 12:27 mark. Then, under two minutes later, Tyler Varin chipped a puck in to the neutral zone where it ping-ponged between players; finally James Belleavoine corralled it and skated into the Brunswick zone on a two-on-one with Cam Marianni driving toward the net. Belleavoine floated a pass over the Bruin’s defenseman’s stick and Mariani put just enough sauce on the shot to beat Dachille. The game would remain tied throughout regulation and into overtime. Both teams had opportunities but to no avail. Shots were 27/26 in favor of Brunswick. Williston is off until the night of December 27th when they will meet up at Nobles for a quick practice and then take on St. Sebastian’s in Needham at 11 am the following day. Fans will remember that last year, the Wildcats went down 3-0 in the first period only to score four straight to beat the Arrows 4-3 in overtime. The following day, Williston takes on the number 7-ranked Nobles Bulldogs at noon. Williston took last year’s game 3-2. So, from the Williston hockey family to yours, we wish you a Merry Christmas and Happy Holidays! The title for this piece is a stick-tap to John Adams, class of ’64 who spoke to the Williston hockey team in the dressing room before yesterday’s Albany game. He later sent a picture of his yearbook with this heading. As the coaching staff read the article, we were amazed at all of the similarities of that team and this year’s club: the Williston’s team’s ice surface (they played on the pond that year—their final season because Lossone was built) gave Coach Carpenter fits; we are playing in a tournament with twenty-five minute halves where near the end of a period looks like a week’s worth of pond hockey on the Erie Canal. They had three returners; we have seven. They had two returning defensemen; and we have two returners. They needed to focus on the defensive zone and let the offense figure itself out; and so do we. They had a brand new goaltender; we have two fresh faces. The similarities were eerie, but as Coach Cunha talked to the team before the start of the game, he reiterated that nearly 50+ years later, things couldn’t be more similar. Adams noted in his email what an honor it was to speak to our group and was thankful for the opportunity and so were we. After the 3-0 loss to Albany last night, the Williston seniors and in particular, our captains, took it upon themselves to figure things out. They spoke openly and calmly listening to their teammates as they discussed what needed to change. Whatever was said in the closed-door team-only meeting had a great impression on the entire group because Williston came out today energized and focused taking the 11 am game 7-1 over Winchendon School. The game started with Williston adhering to their systems and their game plan as they hounded Winchendon in the offensive zone creating turnovers and scoring opportunities. The first goal came at the 12:28 mark of the period when David Novotny took a puck along his own half wall and made a perfect pass to Brendan Nehmer who skated through the neutral zone, broke into the Winchendon side, cut to his left and let a quick wrister go that beat the Wapiti goalie on the far right post. Winchendon scored six minutes later on a breakaway that just beat on outstretched Trevor Corsello under his right pad near the post. Williston responded thirteen seconds later when Mitchell Hansen punched a puck into the left corner to a waiting James Belleavoine who made a move to skate behind the net; he then made a back-diagonal pass to an open Cam Mariani who roofed the puck past the Winchendon’s goalie’s right glove. Williston got their final of the period when Tim Rego got a pass from Jake Sacratini and blasted a shot that was tipped by Novotny at the 5:41 mark. The Wildcats went to the dressing room up, 3-1. In the second half, Williston continued where they left off after the first when Mariani scored his second of the game on the 4×3 power play. Belleavoine took a shot that hit the post but the rebound came to Mariani in the high slot who buried it past the scrambling Winchendon goalie. Williston scored their fifth of the game on the power play when Sacratini conjured some Montreal Magic as he drove low around the left side and put a puck that found the back of the net. Rego and Mariani got the helpers. Williston got their sixth goal, again on the power play, when Rego let a rocket go that beat Winchendon goalie under his glove. Nehmer and Mariani were awarded the assists. Mariani notched a hat trick when, on a 4×3 power play, Belleavoine hit him on the back post where he buried his chance. The game puck went to Mariani for his five-point performance. Corsello came up big on a number of occasions making 23 saves. Williston had 30 shots. Another impressive stat for the Wildcats was their 26-5 on faceoffs. Williston will rest for the remainder of the day and take on the Brunswick Bruins tomorrow at 11 am. Brunswick ended Williston’s playoff run last year in the quarterfinals, 2-0 going on to win the Large School Championship. We hope to see you at St. Sebs tomorrow!